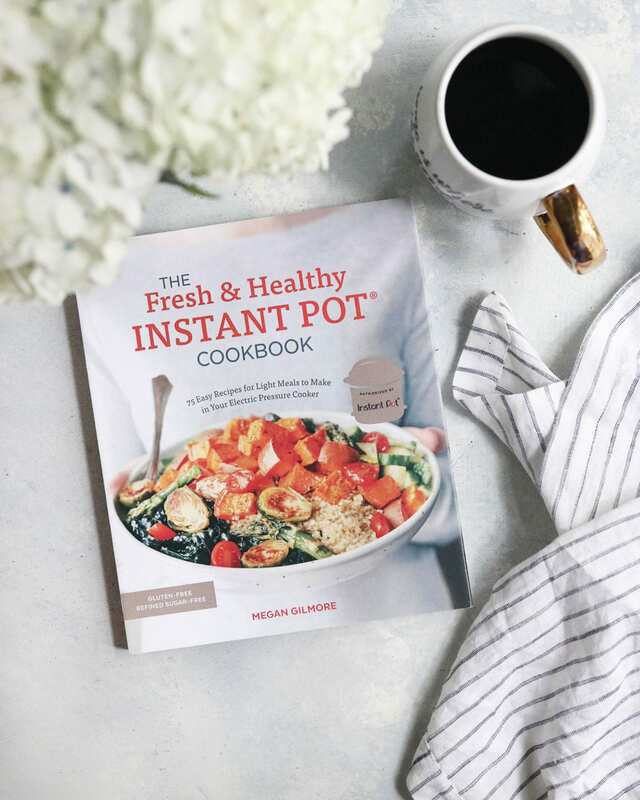 This recipe comes from The Fresh & Healthy Instant Pot Cookbook, which is out in stores today. You can find it at Target, Barnes & Noble, Amazon, and everywhere else that books are sold. I’m so excited for you to have it in your hands! If you love photos in cookbooks, get excited!! Today I wanted to share with you my Hidden Cauliflower Mac n’ Cheese because it was one of my more brilliant moments while writing this book. I noticed that the Instant Pot had the tendency to over-cook vegetables, so I took advantage of that in this recipe. I added a pound of cauliflower directly into the sauce, and voila– it basically dissolves into the cooked pasta when you stir it after the cooking cycle. How amazing is that? This is the perfect recipe for kids and picky eaters in your family. They get to eat a delicious Mac n’ Cheese, and YOU get to sneak a serving of veggies onto their plate. It’s a win-win! If you don’t feel like chopping up fresh cauliflower, you can even use a bag of frozen cauliflower (or try butternut squash for a fun Fall twist) to make the prep process as quick as possible. Hidden Cauliflower Mac n' Cheese in the Instant Pot! 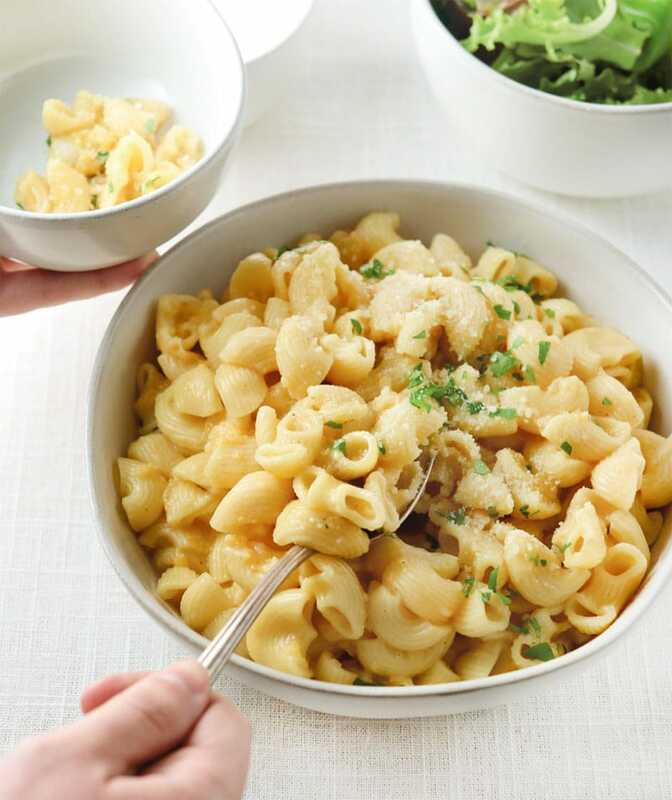 This healthy Mac n' Cheese makes an easy weeknight dinner, ready in about 30 minutes. I love how you can sneak an entire pound of cauliflower into this pasta, because it practically dissolves when you give it a stir after cooking it in the Instant Pot. Vegan & gluten-free variations are included! Pour the pasta into the Instant Pot and add the water, soy sauce, mustard, and salt. Stir well to combine, then add the cauliflower on top without stirring, making sure that the cauliflower layer completely covers the pasta for even cooking. Secure the lid and move the steam release valve to Sealing. Select Manual or Pressure Cook to cook on high pressure for 3 minutes. While the pot is coming to pressure, shred the Cheddar (you should have about 1 cup). When the cooking cycle is complete, let the pressure naturally release for 10 minutes (so don't touch the pot until 10 minutes has passed), then move the steam release valve to Venting to release any remaining pressure. When the floating valve drops, remove the lid and stir the pasta well, using a spatula to break up any pasta that has stuck together or stuck to the bottom of the pot. (A little sticking is to be expected, but it will loosen up when you stir.) Use the spatula to mash any intact cauliflower florets against the side of the pot to help them dissolve into the pasta sauce. Add the Cheddar and Parmesan and stir well. Adjust the seasonings as needed and serve warm. Store leftovers in an airtight container in the fridge for 4 days. 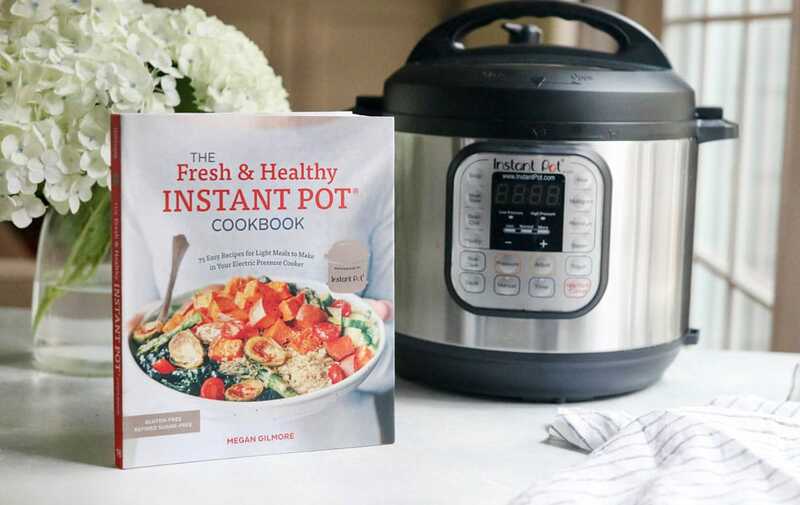 All of the recipes in The Fresh & Healthy Instant Pot Cookbook are gluten-free or include a gluten-free modification, and there is also a tested vegan modification for most recipes, too. 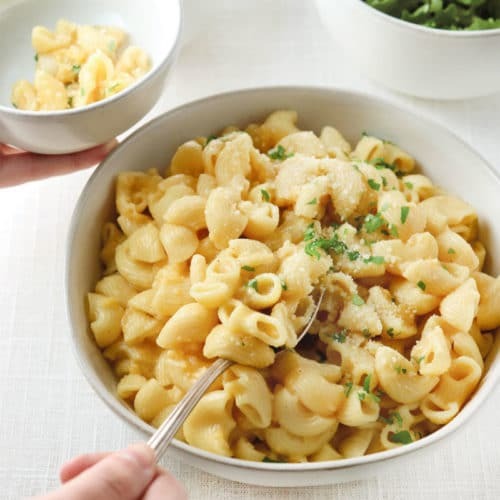 Other than this Mac n' Cheese recipe, all of the sauces are all naturally vegan and dairy-free, to make swapping out the protein easy. Make it Vegan: Use store-bought vegan cheese, or make a cashew “cheese” sauce. Soak 1 cup raw cashews for 1 hour, then drain and rinse. In a blender, combine 2 cups of the water with the cashews, 2 tablespoons freshly squeezed lemon juice, and 1/4 cup nutritional yeast. Blend on high speed until smooth. Add the blended mixture to the Instant Pot, along with the remaining 2 cups water and the rest of the ingredients. Cook as directed. Stir in an additional 1/2 cup water after cooking for a creamier sauce. 0 minutes (see page 17). Let the pressure naturally release for 8 minutes, then continue as directed above. Check the recipe above for gluten-free and vegan modifications. I include these for almost every recipe in the new Instant Pot Cookbook, too. There’s also a vegan & gluten-free Instant Pot Mac n’ Cheese already here on the blog. It’s one of my favorites! Stove Top Method: Combine all of the ingredients into a large pot over high heat on your stove, and add an extra 1/2 cup of water to account for any evaporation that might occur. Bring the water to a boil and give the mixture a stir to make sure your pasta doesn’t stick together, then cover the pot with a lid and lower the heat to a simmer. Cook the pasta according to the directions on the package, about 10 minutes for pasta that isn’t too al dente. (My kids don’t like any “bite” to their pasta, and I don’t either.) Remove the lid and test the pasta. The cauliflower should be tender, and you should be able to press it into the side of the pot, using the back of a spoon to help any big chunks dissolve. If the pasta has too much liquid, raise the heat on the stove and simmer it until the sauce has thickened a bit. Stir in the cheese and adjust any seasoning to taste. Serve warm. I can’t wait to see what you cook from the new book. 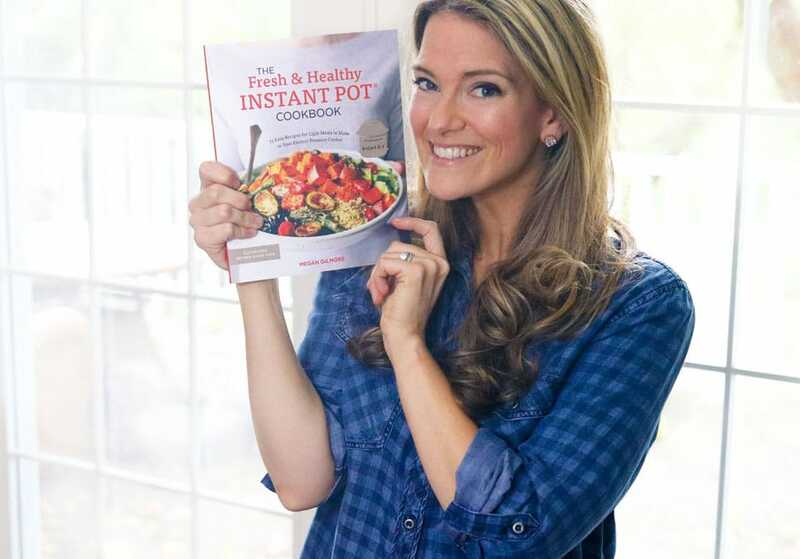 Make sure you tag me @detoxinista or use the hashtag #freshhealthyinstantpot so I can find your posts on social media and cheer you on! Reader Feedback: What other comfort foods would you like to make in your Instant Pot this Fall? This did not work for us. Maybe it was the GF noodles we used, but this turned into a mushy mass that tasted heavily of mustard, not cheese. We love other recipes from Meg, and use them regularly, but we won’t eat this one again. Just made this in my Instant Pot Duo Mini (3 qt) and it turned out great! Wouldn’t change a thing! I made this for my family and they were shocked when I told them cauliflower was a main ingredient! Worked perfectly! I used a pound of frozen butternut squash chunks thawed for a day in my fridge and the orange color was a perfect addition. I might try an additional pound next time to up the veggies even more. I also used gluten free rotini made from amaranth, quinoa, and rice from Costco, yellow mustard in place of spicy brown mustard, and hemp seed “Parmesan” in addition to the cheddar. Thanks, this is the first thing I’ve made from the new book and I look forward to more! Thank you for letting me know! I want to make it with butternut squash next! I made this and the cauliflower did not melt and could not be broken up or smooshed with a spatula. Iused frozen cauliflower and gluten free brown rice noodles. I followed the gf directions. Should I have thawed the cauliflower before putting it in the instapot?The flavors were great. It just turned into pasta and cauliflower. Will this work in a 8 qt IP? Yes, it should! I tested all of my cookbook recipes using both the 6 quart and 8 quart to make sure they’d work for either size. It looks delicious. If I make this ahead of time, how can I reheat the mac and cheese? I would reheat it on the stove top, maybe with an extra splash of water to help it re-hydrate and not stick to the pot as you stir. Make sure you keep stirring it frequently so that it doesn’t stick or burn to the bottom, and then add any extra seasoning you might need right before serving it! I am making this tonight! AND my copy of the cookbook is currently ‘in transit’ so I should gt it today!! Very excited!! Thanks Megan! YAY!!! Thanks, Lisa. Hope you love the new recipes! I made the Mac and cheeses exactly to recipe (Gluten free version) and it was a hit! I was skeptical as I thought it might be mush, but it was great, No signs of cauliflower at all (though we all love cauliflower so it wouldn’t have been a problem). My 10 year old loved it so that is a bonus!! I also got my book yesterday and so more good eats to come. Thanks again Megan!! Also I plan to eat the leftovers today and I will heat them up in a glass dish in my toaster oven. I am sure it will be great as that is my go to reheat method. How long did you cook it for? The gluten free instructions above say 0 minutes – is it meant to be 10 like the regular version? As long as there is a cup of water in the Instant Pot, it should come to pressure. When you cut a recipe in half, the cooking time stays the same but it will come to pressure faster due to less volume in the pot.